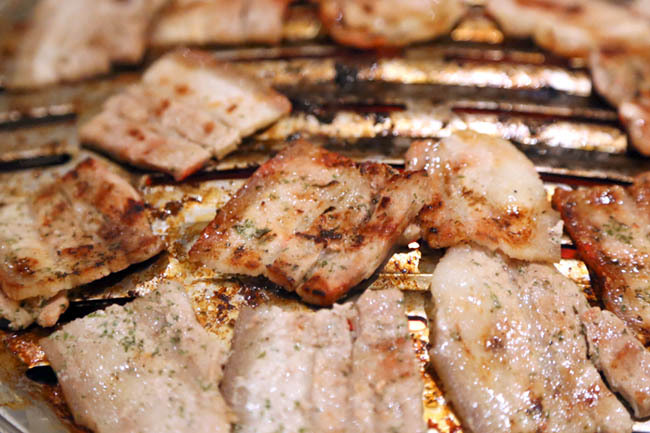 Many love Korean BBQ but the one thing we hate – smelling exactly like Korean BBQ the moment we walk out. The guys do not seem to mind as much, but I know ladies to do not want to get their hair and precious (insert brand) handbags with a grilled pork aroma after a lunch session. That was my main issue with Bornga at The Star Vista that it was very smoky, especially when it is packed during the evening hours. On this visit to Bornga’s new outlet at Vivocity, I noticed black exhaust tubs hanging around the ceiling, and they are actually quite classy modern looking. 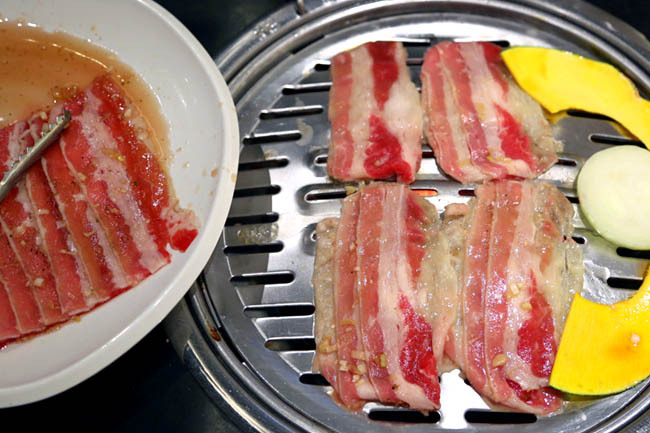 They can be retracted up and down till they are about an inch above the grill, not the big fat greyish type we see at some older Korean BBQ restaurants. The ceiling is taller, the area seems more spacious, and yes, no more ‘aroma’-filled Bornga. 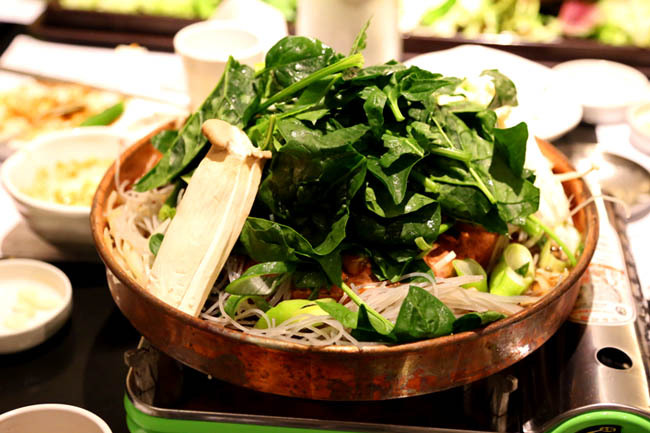 Most customers would order Borgna’s signature meat, the Woo Samgyup ($28 for 200g) which is a patented recipe from Korean celebrity chef Paik Jong Won. The thinly sliced meats would arrive all pinkish and bright, and you would have thought it has not been marinated before. 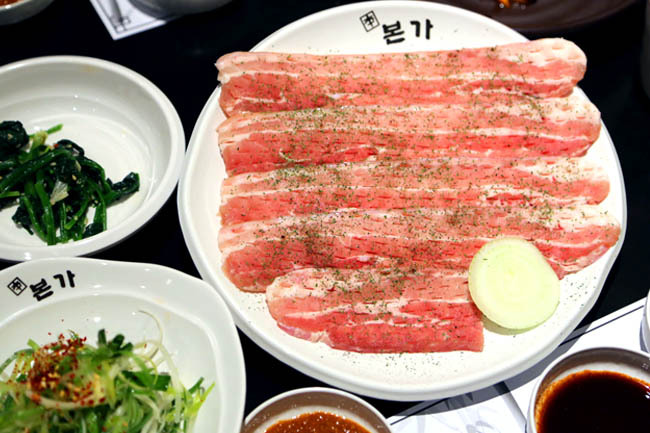 Most marinated bulgogi meats would have appeared covered in a dark-coloured sauce, while this unique Bornga dressing retains the meat’s natural colours. Exciting. There are three new pork dishes. 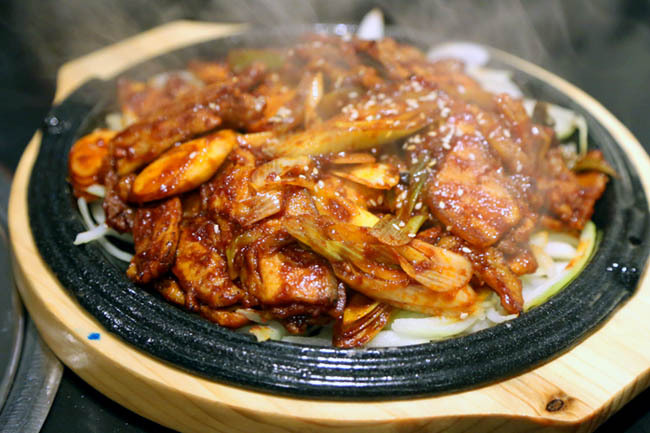 The dish that deserves special mention is the Dwaeji Gohchujang BBQ ($36), which comprises of sweet-spicy pork slices first grilled, stir-fried with onions and served on a sizzling hot plate. This seasoning reminds me exactly of the Korean Dduk Bok Gi sans the rice cake, and I swept the sauce and onions clean with rice. Oh, it is slightly pricey, but at least this portion is good for sharing between four pax. I did notice a change in Bornga, that there are more (clearly) marinated meat offerings, and perhaps because customers prefer more flavourful sauce-covered meats. 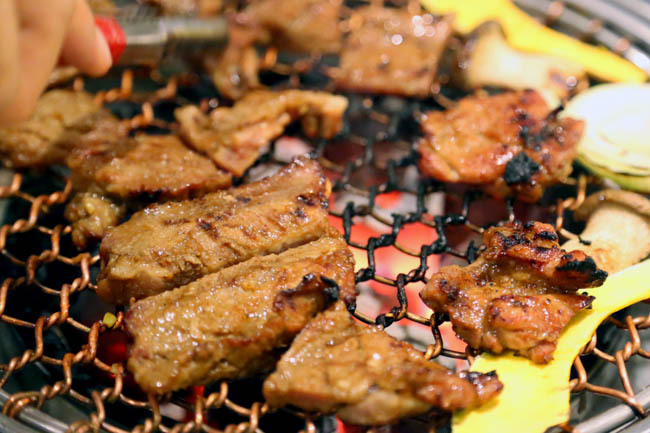 We all went for the Yangnyum Dwaeji Galbi ($33 for 250g) which consists of thicker slabs of pork ribs marinated with a dark brown special house sauce. This was yummy. While the Mansinjang Samgyupsal ($24 for 200g) tenderized but plainer looking pork belly somehow appeared to be less popular. Service was super pleasant surprisingly. There was a service staff (thank you Ken) who helped us lazy customers grill and cut the meats, and the grill plates are frequently changed after each round of barbecuing. He is local, but speaks some Korean. I am impressed. Kamsahamnida! hope tt it's alright to share. Thanks! 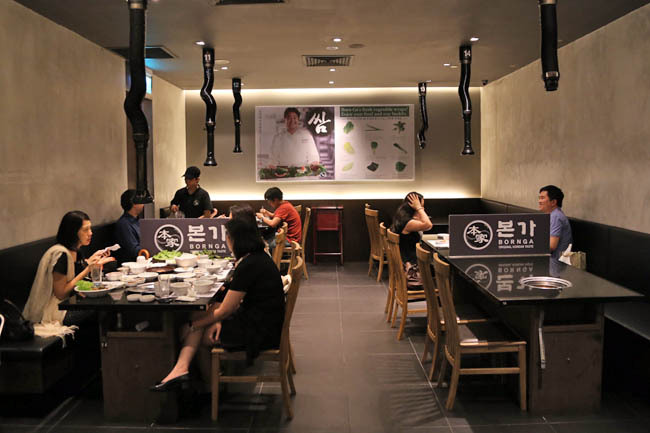 food ok at vivo… service staff need to improve. Liked the food. But the staff was rude, as if I couldn't afford to eat there. Ruined the entire dinner. Never go back again. The kimchi stew is terrible. Not hot and the beancurb is tasteless. Only a few slice of garlic is served, how can korean bbq dont go with garlic. The price paid is totally over price for the food and service provided. Those small korean operate is so much better than here.